IPA Acrylic Splashbacks carry The Australian made logo. We will beat any written quote on custom coloured 6mm cut to size Acrylic Splashbacks & Wall Panels. WE SUPPLY AUSTRALIA WIDE! Our Bellassimo Acrylic range solid colour high gloss sheets, perfect shower panel great for wet areas. 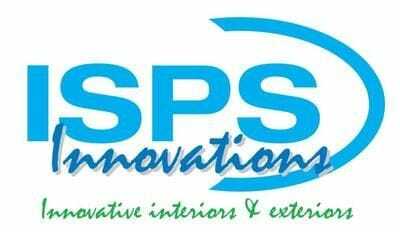 ISPS Innovations create the Alternative Innovative Splashback in many splashback categories. IPA Acrylic splashbacks is a low heat polymer 6mm thickness 90 °C. 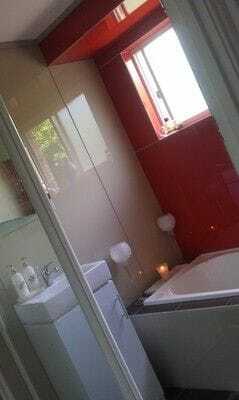 ISPS Acrylic Splashbacks are a superior acrylic substrate, used for shower walls, feature walls, kitchen feature walls, shop displays, underbars, commercial fit outs. IPA Acrylic should not to be confused with Bonethane Premium High Heat sheets. ISPS use the highest grade Acrylic sheeting with 94% light transmission. Trusted proven Polymer systems. Tested since 1998. 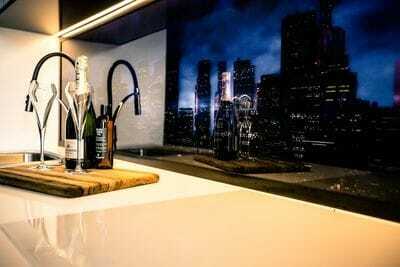 Our custom Acrylic & Bonethane Splashbacks perform exceptionally & with a proven history supplied through the Bunnings chains for a number of years. ISPS are happy to announce we can now bring further savings and delivery to your doorstep with our custom designed polymer range supplied direct to you. 2440 x 1220 x 6mm IPA Acrylic Splashback Free Delivery Australia WIDE . 2440 x 1220 x 3.5 mm IPA Acrylic Splashbacks Free Delivery Australia WIDE. With any 2440 x 1220 IPA Acrylic Sheet , ISPS Innovations offer free delivery Australia wide. IPA Acrylic is Australian Made. IPA Acrylic has a hard wearing surface much like pressed aluminium with a tough durable face. IPA Acrylic stands the test in high trafficked areas. Special cutting instructions are required when cutting any acrylic. IPA ACRYLIC can be cut on site. IPA ACRYLIC does not have same burning properties as BonethanePremium. IPA ACRYLIC available in any colour, EFX & print. IPA ACRYLIC can be shaped on site, use KUTTM8 to assist. IPA ACRYLIC air dries & shines when washed & rinsed. IPA ACRYLIC is 6mm thickness . IPA Acrylic is also available in 3.5 mm thickness. 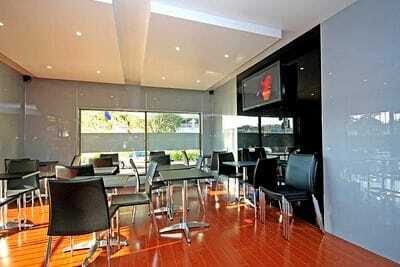 IPA ACRYLIC can be coordinated to suit the decor in your home or commercial fit out. IPA ACRYLIC edges can be flame polished & buffed to clear. IPA ACRYLIC is the only Acrylic substrate wall panel with advanced Bonethane colour technology which has been tested since 1998. Available cut to size up to 2m x 3m sheets x 6mm. Care must be taken with cutting. Acrylics being brittle can split & crack when cutting, especially when they are thinner, so it is important to follow clear step by step instructions. Ensure that you have the correct blade & tools to execute your cuts. Or call us today, we provide a cut to size & cut to shape service when you request your custom order through ISPS additional charges apply. Our Kuttm8 cutting pad is a great tool for cutting Acrylic, view Kuttm8 tab under products and services for more information. All Prices include GST and Delivery to metro states. Addtional charges apply outside metro zones. All skids require a fork lift or a tailgate can be requested at an addtional charge. If you are not available at the time of delivery, goods can be collected from a depo in your state. IPA ACRYLIC does not require the wall coated a neutral colour prior to installation. Our sheets come ready! IPA Acrylic comes with GRIPTEK barrier backing. GRIPTEK , prevents neutral cure silicone bleeding, colour fading, colour delamination, coating wall a neutral colour, GRIPTEK also allows you to safely remove the acrylic sheets off the wall without damaging the integrity of the sheet. Other inferior products simply spray paint the back of leading brand sheets offering misleading warranties. Our coating system is quality tested to withstand climatic weathering, heat expansion and contraction, mould build up & allowing our formulated system to bond into the Acrylic substrate acting as one product..
IPA Acrylic Splashbacks are available at selected Mitre 10 stores or buy direct . 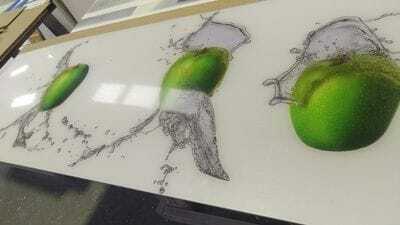 ISPS Innovations Supply Acrylic Splashbacks and Acrylic Marker Boards Australia Wide. ISPS Innovations supply Acrylic Splashbacks, Acrylic Wall Panels , Printed Acrylic Splashbacks to Melbourne, Geelong, Sydney, Central Coast, Adelaide, South Australia, Tasmaina, Hobart, Brisbane, Queensaland, Perth, Western Australia, Woolongong, Northern Territory, Darwin, Doonan, Cairns, all over Australia!